VBSR was founded in 1990 by a group of businesspeople who wanted to pioneer a new focus for business: the multiple bottom line. They believed businesses have as much responsibility to workers, communities and the environment as they do to being financially successful. Initially VBSR was a 501(c)(6) nonprofit, independent but affiliated with NEBSR (New England BSR). VBSR continued this relationship with NEBSR to help build strong state NEBSR chapters and regional networking. The other New England states had a different, less independent relationship with NEBSR. In 1993, the VBSR board decided to end the affiliation with NEBSR in order to fully focus on building VBSR’s organization and programs, and VBSR quickly became a strong independent organization. 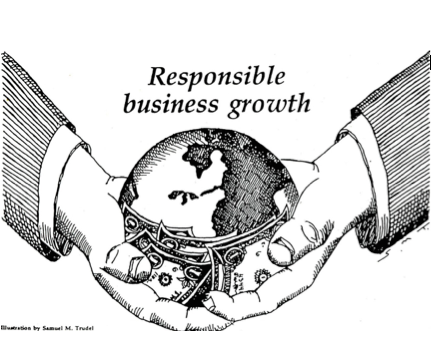 The national organization, Business for Social Responsibility (BSR), was founded in 1992 by some of NEBSR’s original founders. In 1994, the New Hampshire, Massachusetts, Connecticut and Rhode Island chapters of NEBSR became chapters of BSR. Maine Businesses for Social Responsibility (MEBSR) and VBSR did not merge, as each organization’s members preferred to remain as independent organizations. In June 2001, BSR discontinued the chapter structure. It emphasizes larger, multi-national companies and does not engage in public policy. In 2003, VBSR joined Business Alliance for Local Living Economies (BALLE), a national organization with chapters around the nation. BALLE places an emphasis on supporting local economies and small, locally owned businesses. In 2006 BALLE’s national conference was hosted by VBSR in Burlington. Today, VBSR is active in influencing public policy on a statewide level in Vermont. We also provide educational programs and information and networking opportunities for our members through annual conferences, Get-Togethers, and other events. And, we collaborate with many other organizations with similar goals.